SONOMA, Calif.– The Sonoma Stompers announced the signing of pitcher Brian Browning. The former Colorado Rockies pitcher enters his third season in professional baseball, and second in the Pacific Association of Professional Baseball Clubs. “I hope to join the Stompers this season and contribute to their continued success in the Pacific Association! I will be happy getting back on the mound be it starting or relief, and I can't wait to live in the beautiful town of Sonoma!” said Browning. In 2017, Browning played for Boise Hawks of the Northwest League (A-) for the Colorado Rockies affiliate. In 11 games pitched, Browning compiled a 1-2 won loss record in 15.2 innings while striking out 12. “My host family was wonderful and I am still in contact with them today! I played in the Northwest League and was able to travel to beautiful places like Eugene, Oregon and Vancouver, Canada!” Browning said. Previous to signing with Colorado, Browning played three levels of college baseball. The lefty started his collegiate career at the Junior College level at Northwest Florida State College. “My favorite baseball memory would be winning the Junior College World Series my sophomore year. I helped our team by throwing a complete game shutout, day two of the tournament against Iowa Western, putting a stop to their 36 game win streak,” said Browning. With the Raiders he held a 14-4 won loss record in 134 innings pitched with 108 strikeouts. In 2016, Browning then transferred to the University of Mississippi, members of the Southeastern Conference. Browning did not allow a run in three of his four appearances for the Rebels. The Homewood, Alabama native spent his senior season at the Division-2 level for the University of West Florida Argonauts where he held a won loss record of 4-3 with a 3.78 ERA in 50 innings pitched and 41 strikeouts. “It was a challenging transition to be at three different cities and coaching staffs, while losing some school credits in the process... I was able to meet many good guys along the way and I wouldn't change it for anything,” said Browning. In 2017, Browning returned to West Florida to complete his degree in Communications. In 2018, Browning joined the Pittsburg Diamonds of the Pacific Association where he held an impressive 1.64 ERA in 11 innings of work with 13 strikeouts. “He’ll be a versatile member of the pitching staff as he has started and relieved with equal success throughout his career,” said General Manager Brett Creamer. In four seasons of college baseball, Browning holds a 18-7 won loss record in 187.2 innings pitched with 151 strikeouts. SONOMA, Calif.– The Sonoma Stompers will be hosting an open tryout for the 2019 season. Below are the event details and registration link. TIME: 9:30 a.m. registration/check-in, 10:00 a.m. tryouts begin. SPRING TRAINING CONTRACTS: A minimum of two players will be signed to spring training contracts. The Sonoma Stompers are members of the Pacific Association of Professional Baseball Clubs and 2016 champions. In 2019, the Stompers will play against the San Rafael Pacifics, Napa Silverados, Vallejo Admirals and Salina Stockade. The league schedule will run from May 31 through early September. The tryout will follow a full day of workouts and an inter squad game. Advance registration is available here It is strongly advised to register in advance as the number of players participating in the tryout will be limited. Day of the event walk-up registration will begin at 9:30 AM with tryouts starting at 10:00 a.m. on Saturday May 18. Walk-up registration fee is $125. As it is a full day camp, players will be participating in fielding and throwing drills for infielders, outfielders, and catchers, and batting practice for position players while pitchers will throw brief bullpens. All pitchers will throw against live hitters. Field of Dreams is located in Sonoma, CA. If you’re flying in use either Oakland or San Francisco airports. There are many local hotels available. For more information, please contact brett@stompersbaseball.com or office directly at 707-938-7277. 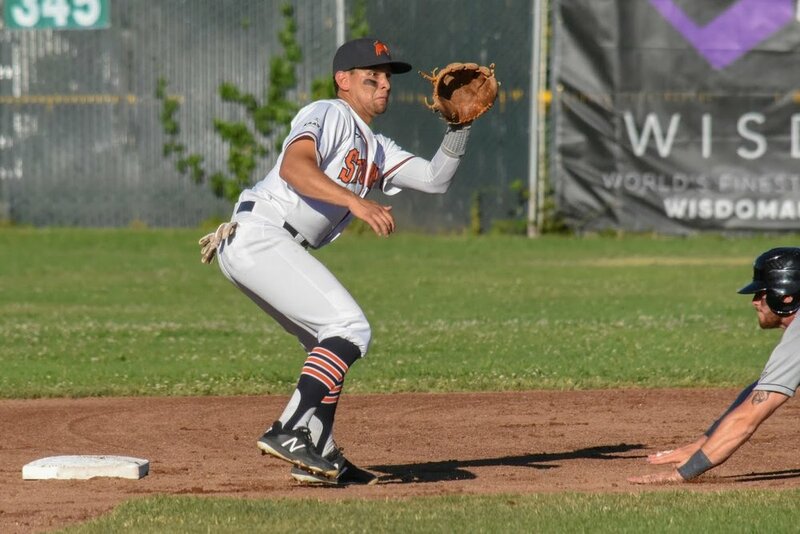 SONOMA, Calif.– The Sonoma Stompers are excited to announce that former pitcher Ryan Richardson will become field manager of the Alpine Cowboys of the PECOS league for the 2019 season. Richardson played for the Cowboys from 2014-2016. “I’m really excited to see baseball from the other side of the ball, I’ve always been intrigued on how managers go about their grind everyday. It should be fun,” said Ryan Richardson. 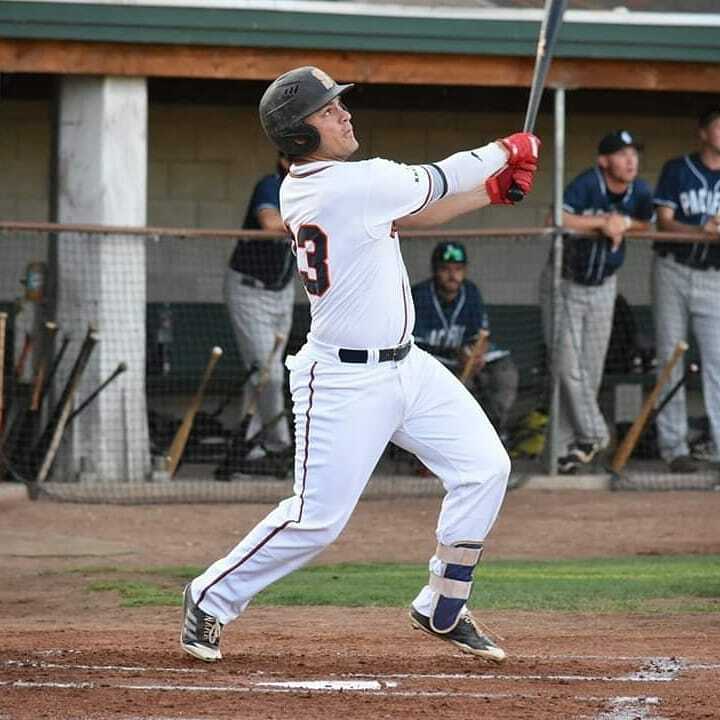 The former Campbellsville University alumnus spent three seasons with the Sonoma Stompers from 2016-2018, including the 2016 championship season. “Being around two managers like Takashi Miyoshi and Zack Pace in Sonoma helped me see how a ball club should be run,” said Richardson. In 2018, Richardson was a key contributor in the Stompers bullpen contributing a 3-1 record with a 2.94 ERA in 30 appearances. More impressively was Richardson’s 43 to 6 strikeout to walk ratio. Ryan Richardson celebrating for the Alpine Cowboys. Photo provided by Alpine Cowboys. “Ryan is very deserving of his new position with Alpine. I’m excited for him, and know he’ll be a valuable asset to their organization,” said General Manager Brett Creamer. Over Richardson’s six year professional career, he’s compiled a 12-9 record that includes a 3.17 ERA and 21 saves. The right-handed pitcher has thrown 221.1 innings while striking out 213 batters to just 48 walks. The 2019 season will be Richardson’s first as a field manager. “I’ve always wanted to do something with baseball after I done throwing,” said Richardson. The 29-year-old has spent time in the Pecos and Frontier league before playing in the Pacific Association with the Sonoma Stompers. Richardson also spent a year in Japan for the Kagawa Olive Guyners of the Shikoku Island League in 2017-18. The Alpine Cowboys are one of the three remaining charter organizations of the Pecos league and have a career record of 348-209 with a winning percentage of (.624%). The Cowboys are scheduled to play 64 regular season games that will run from May 30th to August 3rd. In 2018, Alpine held a 47-15 record which earned them first place in the Mountain division before being defeated in the championship to the Bakersfield Train Robbers. SONOMA, Calif.– The Sonoma Stompers are thrilled to announce their partnership with CPA Jeff Spencer in Association with H&R Block. Among other sponsorship elements, Spencer will be sponsoring the Sonoma Stompers batting helmet. “We’re excited to partner with Jeff Spencer and are counting down the days until the season opener. Now we’re able to provide our players with new official game batting helmets that’ll help our players look good on the field and stay safe ” said General Manager Brett Creamer. The Stompers will be featuring an orange “S” on the front of their batting helmet with a CPA Jeff Spencer logo on the back of the helmet. The Sonoma Stompers are currently seeking a partnership that includes uniform advertisement. For the 2019 season the Stompers plan to produce three sets of uniform tops, including a navy alternate top. SONOMA, Calif.– The Sonoma Stompers are excited to announce they will be partnering with the Sonoma Valley High School Baseball Program during the Don Lyons Sonoma Little League Skills Camp. Stompers players and front office members will join with Sonoma Valley High School coaches to lead Little League players through the camp. The camp is set to take place on January 5th and 6th at Hughes Field, Sonoma, CA at 10:00 a.m. to 2:30 p.m.
Former Stomper player and current Assistant General Manager Eddie Mora-Loera will also be conducting a coaches clinic at the end of the month for the Sonoma Little League. “I think this is good for all organizations involved, our goal is to have a stronger presence in the community and youth of Sonoma,” said Mora-Loera. The baseball camp is held to honor Don Lyons, who coached for the Sonoma Valley High School Varisty baseball team. After being drafted four consecutive years in the Major League Baseball Draft, Lyons signed with the California Angels in 1976. In Lyons’ first season of processional baseball he was assigned to their Rookie Ball affiliate in Idaho Falls where he held a .326 batting average. Throughout his career, Lyons advanced to the Angles AA-affiliate before a career ending injury in 1979. Lyons then joined the San Francisco Fire Department from 1979 to 2000 before retiring. His son Tommy, played for the Stompers from 2014 to 2017. “I’m excited for our organization to give back and to have our players share their techniques, playing experiences, and dreams. This is a great way for the youth of Sonoma to play baseball and pick the minds of our professional athletes,” said General Manager Brett Creamer. SONOMA, Calif.– General Manager Brett Creamer was named Executive of the Year for the 2018 season. Creamer was the youngest General Manager in all of Professional Baseball during the 2018 season at 25 years old. “I am thrilled to be recognized for the Executive of the Year Award,” Creamer said. “This season would not have been possible without my incredible front office staff Hayley Slye, Joey Samuelson and Manager Zack Pace. Our entire front office, coaching staff, players, interns, volunteers, day of game and Palooza staff were vital in making this record breaking year possible,” Creamer said. The Petaluma native joined the Sonoma Stompers during the 2014 inaugural season as the Director of Game Day Operations and Community Affairs before working three seasons for the Golden State Warriors in event and arena operations. He also gained Major League Baseball experience in the ticketing department for the Oakland Athletics before returning to the Stompers as Assistant General Manager in 2017. The former Bowling Green State University Sport Management Graduate was named General Manager this past November. “I was given a great opportunity from our owner Jon Sebastiani, and never looked back,” said Creamer. The clubs attendance rose to 17,501 which was up over 70% from the previous season. Creamer also formed a partnership with Palooza Brewery and Gastropub from Kenwood which provided the first restaurant dining experience in Pacific Association history. “Brett set the character of the Stompers family. He lead with good communication and positive outlook toward our goals. It was a pleasure to see him lead the Stompers in 2018,” said Pace. Pace and Creamer helped lead the Stompers to the best record in Pacific Association history. Their 57 wins marks the most since the 2013 season where the San Rafael Pacifics had 54 wins. “Brett has always made me feel wanted while playing here in Sonoma. This can be difficult with such a high turnover rate for players in Independent league baseball. Now that I have transitioned into the office, I am able to see the changes Brett has made that have improved the finances of the Sonoma Stompers,” said former player and current Assistant General Manager Eddie Mora-Loera. This is the second time the Stompers have won the Executive of the Year award. Theo Fightmaster, who hired Creamer in 2014 won the award for his accomplishments during the 2016 season. “Theo is a great mentor of mine, and I’m excited to be working with him again,” Creamer said. Fightmaster is the newly appointment Pacific Association commissioner for the 2019 season. The Pacific Association Most Valuable Player Award will be announced Wednesday December 12th. SONOMA, Calif.– Zack Pace is the 2018 Pacific Association Manager of the Year, which was voted on by executives, coaches, and broadcasters. The Pacific Association has given Manager of the Year awards since 2014. Pace led the Stompers to a league best 57-23 record and a championship appearance. This was Pace’s first season with the Stompers, and first professionally. “I am thankful for the whole Stompers family. From Brett and the front office, host families, sponsors, fans, players, and everyone else involved. With great communication, we all worked hard towards our goals and doing the right thing. It was a pleasure to see a positive atmosphere daily created by everyone on the Stompers family,” said Manager Zack Pace. Following a successful career of 11 years and 853 games played across the American Association, Frontier League and Pacific Association. Pace played five seasons for the San Rafael Pacifics and won three Pacific Association Championships with San Rafael, including the 2014 season in which he hit .321. Pace had a career .268 average, 810 hits in 3,019 at-bats. He stole 214 bases and finished with a lifetime on-base percentage of .402. The lefty attended college at Sonoma State and most recently coached at his alma mater under head coach John Goelz in 2007 and from 2014 to 2018. Pace and the Stompers set the Pacific Association single season win total with 57, and an impressive .713 win percentage. “Zack and I shared the same vision from day one. We were able to execute our plans effectively and promote players to higher leagues as well… he exceeded my expectations, and is truly a vital asset of the Sonoma Stompers. From his on field demeanor to his off the field upbeat personality, he embodies the Sonoma culture,” said General Manager Brett Creamer. Assisting Pace was Sonoma Stompers pitching coach Mike Nunes. Nunes played at Sonoma State in 2004 and was a graduate assistant in 2005, when current Stompers manager Zack Pace joined the Seawolves. After finishing his time as a GA, he pitched in 26 games for the Mesa Miners of the Golden Baseball League, recording a 3.83 ERA. Mike spent 2006 and 2007 with the Sioux City Explorers of the American Association, including the 2006 season with Pace. Since 2015, Nunes has been an assistant coach at Sonoma State, where he assists in coaching the pitching staff. Wes Phillips rounded out the coaching staff for the 2018 season. Across four years of Division 1 and Junior College baseball, Phillips was a career .292 hitter with five home runs and 57 RBIs. The Wichita native spent 19 games with the Wichita Wingnuts of the American Association in 2017, where he collected nine hits and four runs scored. Phillips coached first base and played in two games with the Stompers during the 2018 season. The Stompers have now won three of the past four Manager of the Year awards. Former Stomper skipper Takashi Miyoshi won the award in 2016, and shared the title with Vallejo Admirals Manager P.J. Phillips in 2017. Miyoshi spent the 2018 season as a bench coach with the Minnesota Twins Rookie affiliate where they won the Appalachian League championship.